You are currently browsing the tag archive for the ‘marine’ tag. 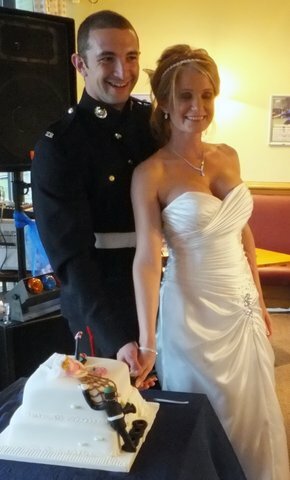 I was called upon to create this bespoke and unique Wedding cake for a ‘Royal Marine Groom’ and a ‘Fitness Instructer Bride’. 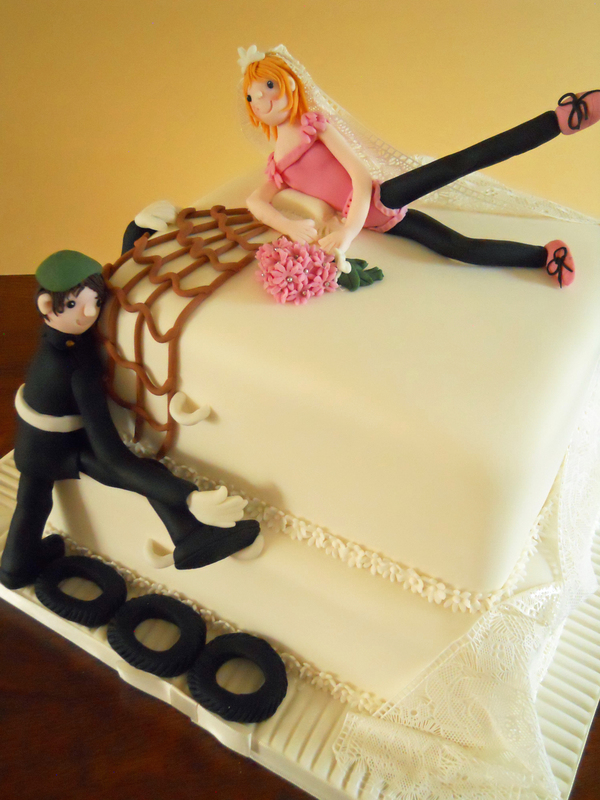 The overall design being the Groom maneuvering over an obstacle course to reach and marry his bride. 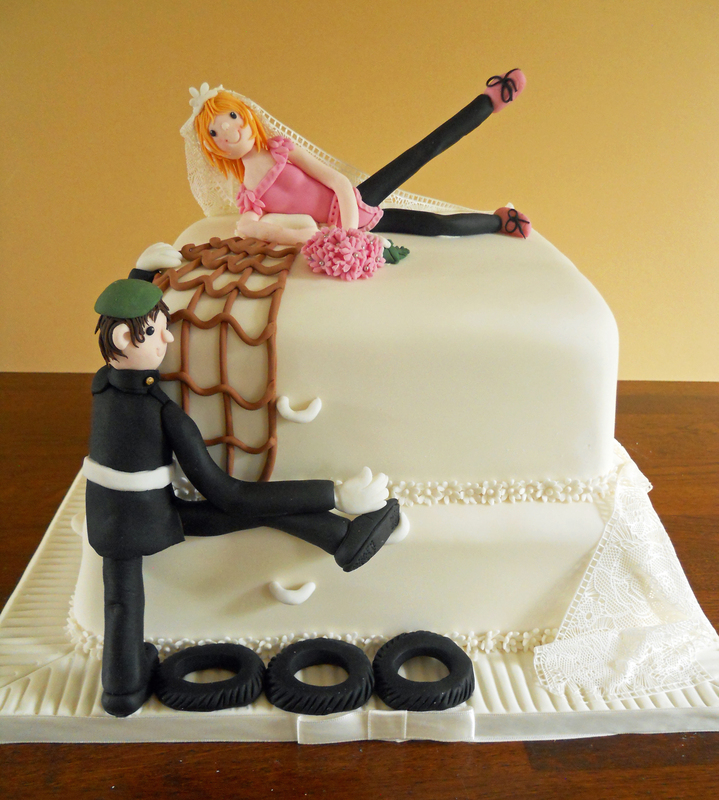 The Marine has just got over the handmade tyres, he is then climbing the wall up the hand holds and has yet to pull himself up the rope to deliver the Wedding ring. 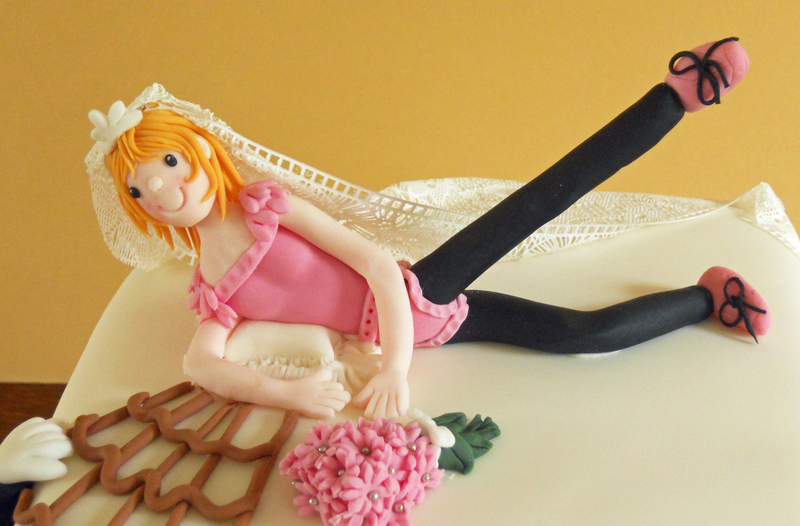 The Bride is exercising on the top with her veil, made from edible lace, flowing down and around the cake with her bouquet of pink flowers waiting for her husband to be. Ha ha, everybody was highly amused by Greg clambering up the cake with the ring to get to Charlotte on the top doing her workout. Greg said it was ‘hoofin’ which in grown up speak means absolutely fabulous and Charlotte loved it. So it hit the spot and tasted pretty good to. Can recommend the carrot cake as a nice change. If you’d like me to decorate a similar cake for a Wedding then please feel free to contact me for a quote. I am ased in Nottingham and can deliver in the East Midlands area.